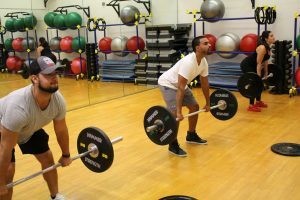 Home - News from the Y - What Exactly is Small Group Training? Small Group Training (SGT) presents the opportunity for people to experience the benefits of the creativity and motivation of a trainer, while lowering the financial entry point and/or spending more time with the trainer for the available funds. Some clients may potentially do both — pursue one-on-one training so they can work on their individual concerns relating specifically to their bodies, and at the same time, enjoy the experience of training with others. Workouts love company: sharing the workout enhances the experience for participants. Adherence – Research shows that members involved in programs are more likely stick with it. With all of the previously listed benefits, how could you not want to keep coming back? Fun – Yes, fun. The right exercise program done with friends can definitely be fun! Looking for a perfect blend of strength and cardio? 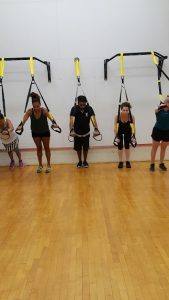 TRX Fit addresses the foundations of improving your cardio, building muscular endurance, and promoting weight loss. You’ll experience four great endurance rounds, each one followed by a “heart thumping” cardio challenge. This quintessential experience will lead you down the road to your best all around fitness. Synergy 360 specializes in using customized progressive workouts with modifications to fit individual needs, while enjoying the fun of a group class designed to create memorable experiences for all. Combining strength training and yoga, this boot camp style class encourages parents and kids to exercise and be healthy together.